I ambled down the isles of Whole Foods this evening in a clueless, hungry dither. Hours and hours of spring cleaning can wear a woman out no matter how joyful she might be about the carefully stowed away wool sweaters or a magnificently organized linen closet. Random supper ideas flew through my brain; fish, pizza, maybe a salad. I sampled some cheese and said hello to the charming cheese guy, which reminded me that I had homemade ricotta cheese in my fridge. I headed to the pasta section and picked up some egg noodles and thought a kugel might be nice. As I passed the meat counter I noticed that they were selling ground lamb from a local farm and suddenly, a lamb burger or lamb sloppy joe sounded good. Into my shopping basket went the lamb. Warming to the sloppy joe idea, I grabbed a can of fire roasted tomatoes. I finally found my way out of the store and once home I unpacked my purchases. I sliced some onion and cooked it in olive oil with a bit of chopped garlic and added the lamb. When the lamb was nicely browned, I poured in a bit of dry white wine and then added the canned tomatoes and a sprig of fresh rosemary and a little salt, pepper, and oregano. The mixture smelled delicious but I realized that I had not picked up buns for my sloppy joes. I had ended up buying the egg noodles despite discarding the kugel idea so I quickly boiled some water and cooked the noodles until tender. 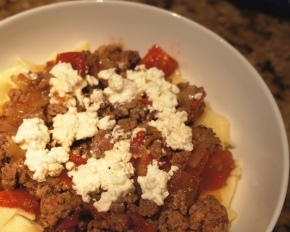 I spooned the lamb mixture over the noodles and then decided I would top the messy dish with the homemade cheese. Passover is almost here and one of my favorite dishes is not served at the seder. Usually the morning after the big family gathering or on the weekend during Passover we always make Matzo Brei. It is the French Toast (sha don’t even mention bread during the holiday) of Passover. 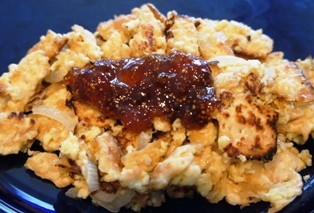 A simple dish of matzo and eggs which is usually served with a little sugar or jam on top. While I love the classic version, I thought it would be fun to mix a family favorite breakfast, cheesy scramble, with matzo brei. 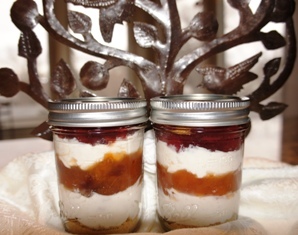 I topped it off with a dollop of fig spread which is wonderful on sweet or savory dishes. I don’t keep a Kosher kitchen but for those that do these is a fabulous Kosher for Passover sharp cheddar from Cabot that would be great in this recipe (I used the regular sharp cheddar for this version). Heat a large skillet and add butter. When the butter is just starting to sizzle add onions. Cook onions to tender and translucent but not brown. Beat the eggs and milk in a large shallow bowl. Break up the matzo into pieces and place in a colandar. Wet the matzo briefly with warm water but do not soak and allow water to drain. Carefully transfer the matzo to the egg mixture and allow to stand for a few minutes until some of the egg is absorbed by the matzo. Toss in the cheese and add salt & pepper. Pour the matzo mixture over the onions and cook on medium, stirring the mixture until the eggs set and bits get lightly browned. Serve immediately topped with fig jam. For holidays and celebrations, I love spending a day baking, filling and frosting cakes; whipping egg whites into fluffy meringue; crafting fancy cookies but sometimes you need a light and easy treat to share. This jam layered no-bake fat-free cheesecake is simple to make and travels well. Perfect for pot-luck suppers or community events. Blend an 8 oz package of fat-free cream cheese with 2 cups of fat-free Greek-style yogurt. Add 2 teaspoons of raw honey and a pinch of cinnamon to the yogurt mixture. Mix Graham cracker crumbs with a few teaspoons of apple cider. Layer the Graham cracker crumbs in the bottom of each jar. Add a layer of the cheesecake mixture and then a layer of jam. Add another layer of cheesecake mixture and jam. Cover jar and refrigerate until ready to serve. With our beloved Patriots going to battle in the Super Bowl this weekend, the supermarket was filled with every kind of junk food you could dream up (and a few that tested the limits of imagination). No I will not be buying pretend cheese food glop to slather over my pizza flavored chips. 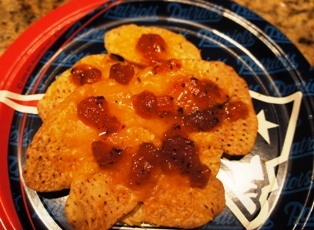 I love football and I love snacks but I want to nibble on something delicious while I cheer on the home team. I tasted some Food Should Taste Good chips at Whole Foods and they were great. I brought home a bag of their Sweet Potato chips which had much less salt and fat than my usual choice of chip and I had a plan. When I got home I grated some sharp Cabot cheddar and opened a jar of Evil Apple (my spicy apple & chipotle conserve). I sprinkled the chips with cheese and melted it in the oven. I spread the Evil Apple over the cheese and with very little effort had a great game day snack that was healthy, local and full of flavor. Go Pats! 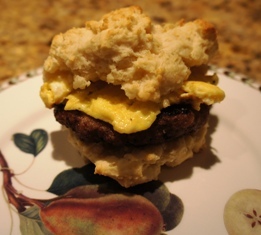 Biscuit, Egg, Cheese, and Lamb? I have to admit that I sometimes I crave awful drive-through breakfast food. If you need to stop reading my blog or unfriend me on Facebook after this revelation, I will understand. This morning, over tired and stressed; the greasy, salty siren song of the McSomething called to me as I drove to a meeting. Somehow I was able to resist and tonight I rewarded myself with a slow food biscuit, egg, cheese, and sausage late night supper. I tossed together some cheddar biscuits (similar recipe to the corn biscuits here, but without corn and with 1/2 cup shredded cheddar) and while they were baking, I found the frozen lamb and apple sausage patties I had saved from my Lamb ProAm supper. I browned the sausage nicely in a hot pan and put it aside while I soft scrambled a Golden Egg Farm egg. I took a hot biscuit right from the oven and piled on my lamb sausage and topped it with egg and arranged it on a pretty plate. The Egg, Cheese, Lamb Biscuit was a delicious treat and I didn’t even miss at all the experience of peeling stuck cheese from the paper wrapper or dropping chunks of egg in my lap as I swerved to avoid a maniac driver on Route 3. Garlic scapes are an early spring treat at farm stands and the farmers markets. 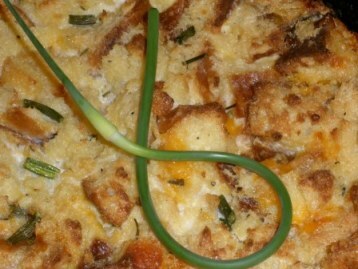 The fresh and sweet garlic flavor works well in stir fried dishes, the scapes can be pickled, and are an excellent complement to egg dishes such as quiche or this cheddar and garlic scape bread pudding. I have made it with sourdough bread but I like it best with a flavorful semolina bread. If you see the curvy green scapes at the market grab some now as they will be gone in a few weeks. For the last several years on the opening day of the farmers market in my town (Arlington MA) I celebrate by making a dinner from whatever I find at the market. This year Chestnut Farms brought ground goat and Smith Country Cheese brought fresh goat cheese from Westfield farm and I thought that these would be delicious paired together. 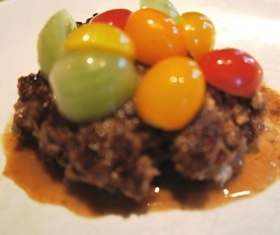 I served my double goat burgers with baby tomatoes which I quick pickled and steamed asparagus both from Kimball Fruit Farm. Young goat provides a mild-flavored, rather lean meat and the addition of goat cheese along with some fresh chopped herbs from my garden gave it a richness and brought out a hint of sweetness. It was a perfect pair! 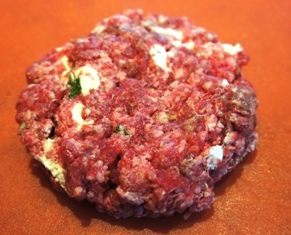 Cook for a few minutes and then pour sherry over the top of the burger and cook until done to your taste.